The short answer to the question, “What can Invisalign do for me?” is “A lot.” If you’ve ever worried that straightening your smile would mean giving up your professional image, Invisalign can put your fears to rest. With Invisalign, you can finally have the improved smile, the improved confidence, and the improved lifestyle you’ve dreamed of. Invisalign uses a series of custom-made acrylic aligners to gradually move teeth into their ideal alignment. You’ll wear each pair for about two weeks until you’ve completed your treatment. Because Invisalign uses clear trays to straighten teeth instead of brackets and wires, you can look forward to straightening your smile without drawing attention to your braces. Most people won’t even know you’re wearing them. 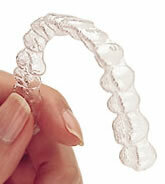 But what sets Invisalign apart even more from other orthodontic solutions is that Invisalign’s aligners are removable. That means you can remove them for special events – like an important meeting or night out with friends – or for regular brushing and flossing. By removing them to brush and floss, you can ensure that your teeth get the thorough cleansing they deserve. With bracket-and-wire braces, on the other hand, it can be difficult to really give teeth the care they need to stay healthy, resulting in unintended cavities. If you’d like to learn more about how Dr. Salivonchik can help you transform your smile with Invisalign, call our office today to schedule a consultation appointment. We’d be happy to answer any questions you might have, in addition to explaining treatment more thoroughly. Call us today if you live in and around the Lehigh Valley area. Comments Off on What Can Invisalign Do for Me?